Yes, you read that headline correctly. 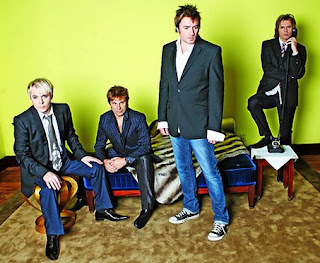 Today is National Duran Duran Appreciation Day. Who decides these 'appreciation' days, I have no clue, but I'm a long-time Duranie so I feel that this celebratory day is completely justified. Despite the fact that I'm *still* majorly p**sed off that the band skipped my city on their latest globe-sweeping tour...I'm not holding a grudge...nope! Still marking today's festivities and pledging my eternal love to Simon Le Bon. Some crushes just never die! I had no idea - and I missed it! That would have SO improved my blah day yesterday.... But really, every day is a DD day, isn't it. 2. They've decided to give up on RCM and are going back into the studio to start on a new project. Personally, I'm all for option 2 -- RCM was just not their best work. I had high hopes when Astronaut came out, but then they followed it up with a Timba/Timber clone that just didn't display their talents at all.